On Thursday April 24, 2014, Objex Unlimited and 3D Systems hosted the “3D Printing Designs in Full Color” live webcast, demonstrating the amazing full-color printing capabilities of the ProJet® x60 series and the ProJet® 4500 (the world’s first full-color plastic 3D Printer). The webinar demonstrated to users the amazing potential of 3D Systems’ new ColorJet Printing (CJP) technologies. If you missed the webinar or would like to view it again, you can view a recording by clicking the “Watch Webcast Now” button above, or by clicking here. Attendees of the webinar were given the chance to learn, interact and ask questions all about ColorJet Printing. Objex Unlimited took part in demonstrating how they integrate ColorJet Printing technology to help their clients acquire new and recurring business, speed-up product development, and significantly cut ongoing costs. ColorJet Printing is the only 3D printing technology capable of printing solid, realistic plastic parts in up to 6 million colors for eye-popping, photorealistic models. ColorJet can speed up product development cycles, bring to life demonstration and concept models, and introduce new methods of model-making for architecture, entertainment, and medical field applications. In addition to producing models full-color, CJP is one of the fastest methods of 3D printing, at a speed of one vertical inch-per-hour, without compromising high-resolution, size or complexity. The ProJet 4500 is the first ColorJet Printer to print in plastic, offering the additional benefits of increased durability and flexibility of models. Objects printed by the 4500 require minimal post processing to look great, and can survive fully submersed in water. A unique feature of the 4500 is the ability to easily map textures onto the models, which not only reduces the amount of work for designers, but allows for unique designs and color gradients on the surface of models. Objex Unlimited provides 3D printing and scanning services for jewelry design and casting, geospatial prototyping, medical modeling, architectural models, and archaeological modeling, to name a few. Explore how Objex Unlimited integrates ColorJet Printing (CJP) technology to help their clients acquire new and recurring business, speed product development schedules and cut costs. Objex Unlimited provides 3D printing and scanning services for jewelry design and casting, geospatial prototyping, medical modeling, architectural models, archaeological modeling. 3D Systems‘ ColorJet Printers set the standard for true, full-color printing, speed and affordability. 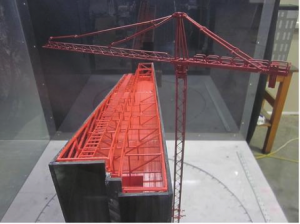 See how CJP printers can be used to produce exceptional high-resolution, large architectural models, industrial molds and castings, product design concepts, single-piece scale prototypes and more. 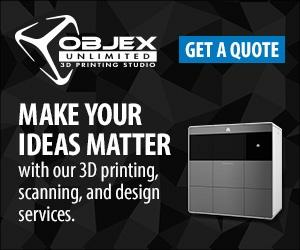 If you’re a product designer, engineer, architect, manufacturer, animator or educator, don’t miss this inside look at how 3D Systems and Objex Unlimited engage 3D printing to Manufacture the Future. We have great news for all of you Tech-Savvy Mac users who love 3D Printing and 3D Scanning. All of you Mac users can now enjoy Sense, an at home 3D scanner, fully integrated with Cubify.com and the Cube 3D printer. The Sense allows users to upload their scans directly for 3D printing either at home or through the cloud. It releases the scans in STL files and PLY files. Mac users should get excited for the newly announced support for 3D Systems. The Sense is the first 3D Scanner that is specifically designed for easy customer use and optimized for 3D printing. It is now easy and fun to capture priceless moments in 3D at a cost of only $399. The Sense software V1.1 features Mac support and many other feature upgrades. The feature upgrades include: improved scan tracking and stability, upgraded auto-enhancement for correct brightness and colour. These features build on the very easy-to-use interface that allows anyone to focus, crop, delete, and share colour 3D data. 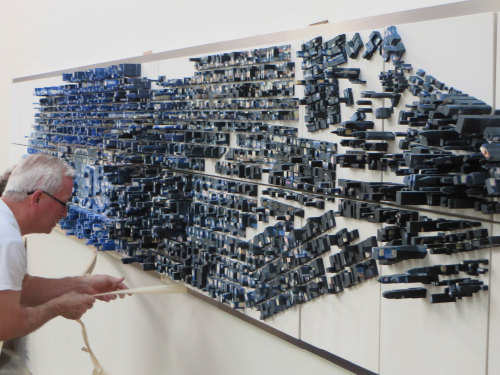 In early 2014, Vick Art Advisors tasked Sparks, a brand experience company talented at creating vibrant environments and activations, to create a sculpture that abstractly depicted Manhattan. The problem was that the deadlines were tight thus demanding a quick turnaround. Sparks’ 3D design team got together to brainstorm an art installation that would truly depict Manhattan in a unique manner. The team then thoroughly explored options on how this art installation could be physically created. They researched hand fabrication and CNC technology, but realized that 3D printing was the only logical option for the complex full-colour 3D project they had in mind. However, getting 3D prints made quickly was still a critical factor so they turned to Quickparts on-demand 3D printing serviced from 3D Systems. “Quickparts has a wide range of 3D printing options for different types of projects . 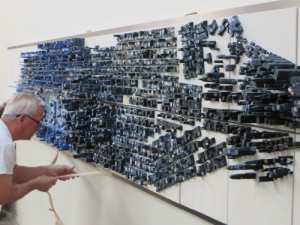 However, we needed to print very large models very quickly and in full CMYK color, so their ColorJet Technology was the one option that made this even feasible,” said senior designer David Shamlian. In the end Quickparts completed the project in record time on deadline. Its also amazing to keep in mind that this was done while parts were printed on a full-colour Projet 860 3D printers that were thousands of mils apart and on different continents. 3D Systems has announced that it has partnered up with Staples, Inc. to start a pilot program in which two staples stores in New York City and Los Angeles offer 3D printing services. Each of the staple stores will feature an immersive 3D printing experience center where consumers and small businesses can create personalized products and use 3D printing hardware. Customers will also be able to bring in their own 3D print-ready files to have them printed. With these new 3D printing experience centers customers can learn more about 3D printing through demonstration areas where they can use design software and see 3D Systems printers in action. Each store will also include the 3DME® Photobooth from 3D Systems to capture customers’ facial images for the purpose of personalizing 3D products like figurines, and customers can also print personalized smart phone cases. 3D Systems on-site experts, along with trained Copy & Print associates from Staples to help guide customer on their 3D printing journey will be available at each store. The items can be printed on site or through 3D systems and shipped directly to the customer’s office or home. 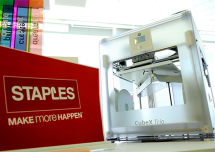 Staples previously announced that it would be the first major U.S. retailer to carry 3D printers, with the launch of the Cube® from 3D Systems on Staples.com. Staples has since rolled out 3D printing hardware and accessories in a limited number of stores, and expanded its overall product selection. Tracheobronchomalacia (TM) is a rare condition where a person can only take shallow breaths or struggle to breathe at all and in worse case can lead to death. 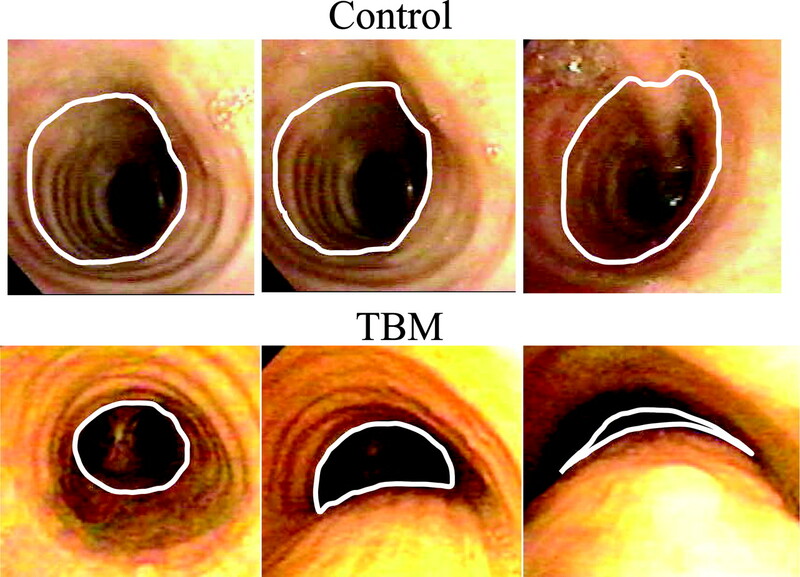 This occurs when the trachea (the main trunk of system of tubes by which air passes to and from the lungs) is weak due to soft cartilage in a certain area or throughout the trachea and the mainstem bronchi (the main passageway into the lungs) are involved as well. 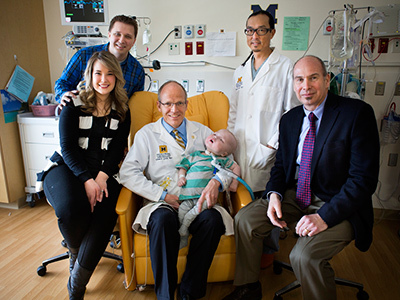 Above is a picture of the second baby who’s life was saved with a new, bioresorbable device developed at the University of Michigan by Dr. Green and Dr. Hollister. Together they attended TEDxUofM to talk about their work. 3D Systems has announced that it is supporting the 3D printing project “Engaging Young People with Assistive technologies”. 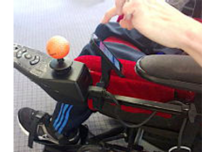 The 3D printing project is a program for students with physical disabilities at Hereward College in Coventry, United Kingdom. The University of Warwick funds the project and since September 2013, it has been empowering physically challenged students through 3D technology to help them design objects that make everyday life easier. Using the CubeX 3D printer from 3D Systems, students from Hereward College are learning to design and print useful implements that can help them over come their everyday challenges. For example a person, who suffers from conditions such as muscular dystrophy, can find tasks such as drinking from a glass or bottle difficult, even when using a straw. “It is great to see 3D printing powering projects such as this that allow students with disabilities to improve their lives while learning STEM skills that are crucial for their future employment,” stated Leanne Gluck, Director of Social Impact, 3DS. The project is delivered by the Access Research & Development Department at Hereward College and Warwick manufacturing Group (WMG). They have extensive expertise in additive layer manufacturing, and the department of Computer Sciences, which has strength in adaptive systems. The project is apart of a larger initiative by the University of Warwick to engage with groups of learners that are currently under-represented in science and technology at the university degree level. Medical Modeling has pioneered the leading 3D medical technology that comes with extraordinary benefits. If you would like to see these benefits look no further than the many conjoined twin separations the company has supported like 3D systems, which they newly joined forces with. In each case, medical modeling’s 3D imaging and physical models have created a successful procedure by allowing surgeons a true-to-life view of the patients’ shared anatomy before the first incision is ever made. Doctors can fully prepare for the procedure, which leads to the patient spending less time in the OR. Medical Modeling’s lineup of virtual surgical planning tools, implants production services, tactile medical imaging, and more revolutionizing clinical treatment. VSP is about utilizing medical image data to accurately plan surgery in a computer environment then transferring that virtual plan to the patient using customized instruments. Medical modeling focuses on taking medical images from the computer screen to the 3D world. Additive manufacturing processes and materials of different kinds are used to produce physical anatomical models used in surgeries such as reconstruction of the cranium and the hip. 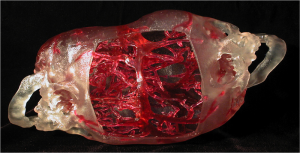 Now that Medical Modeling is a apart of 3D Systems, they will have even more access to state-of-the-art 3D printing and modeling tools, allowing both companies to head forward together with cutting-edge medical imaging and surgical planning. 3D Systems and Medical Modeling hope to enable better quality medical care and improve patient outcomes throughout the world, through3 their collective strengths, knowledge, and visions. 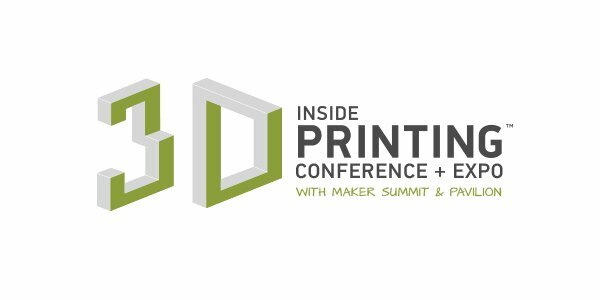 3D Systems has announced that it is brining its 3D PRINTING 2.0 to the second annual Inside 3D Printing Conference and Expo in New York City. 3DS is planning to demonstrate its powerful 3D design-to-manufacturing products that are designed specifically for the production floor and the engineer’s desktop. “The company invites attendees to experience the first and only professional full-color plastic 3D printer, try its fab-grade multi-materials 3D printer, and see the output of its latest direct metal 3D printers, all capable of printing fully functional parts and assemblies and available for immediate purchase.” Inside 3D printing NYC conference takes place April 2-4, 2014, at the Javits Convention Center in New York City, NY. 3D Systems Presiedent and Ceo, Avi Reichental will deliver the opening keynote on the morning of April 3, 2014. He will discuss how 3D printing is transforming and localizing manufacturing, highlighting key trends and sharing advanced manufacturing initiatives. The use of physical models in court is not a new concept. For decades now, small-scaled models of crime scenes and other pieces of evidence have been entered into court to show jurors where and how a crime may have been committed. However, the use of 3D printing in investigation and court purposes is still new. This may be due to a lack of knowledge of complex technology, cost, and what can be done with 3D printing. It makes you question why people haven’t seen the benefit of 3D printing for use in court. 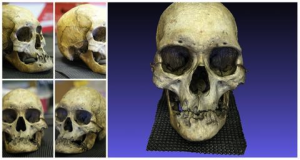 One reason why 3D printing for forensic use is not such a common practice is the fact that close range scanners that accurately record smaller pieces of evidence like skulls, bones, and shoes are not commonly owned or used by police departments. Fortunately, a local 3D printing and 3D scanning service provider with equipment capable of digitizing a particular piece of evidence should be in close proximity. The first step to creating a 3D printing object is to be able to digitize the object into a 3D model. The second step after an object has been documented in 3D is to ensure that the model is made into a continuous volume without any “missing pieces”. The final step is the actually printing process itself. Now that the 3D printed model is made. It can be used in many application which include training aids, investigative tools, test pieces, or as evidence submitted in court so that jurors may physically hold a replica of an important object in their hands. 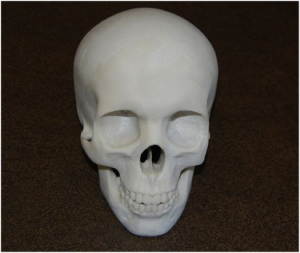 Below are some further examples of practical applications for 3D printing in the forensics field. Creating replicas of pieces of evidence is not a new practice in forensics. 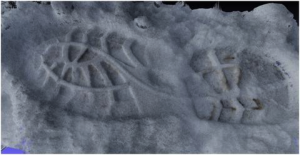 Investigators and scientists have used materials such as dental stone to create casts of footprints, Mikrosil for tool mark impressions, and other materials that can replicate the surface of an objet either by impression transfer or curing, for years now. Although, footprint casting with dental stone is a common technique, it is not always practical when the substrate material is prone to deformation or when the substrate is rapidly deteriorating. On a crime scene time can often be a factor and in many remote areas where resources and equipment may not be readily available, first responders have an opportunity to capture photographs of evidence using nothing more than a digital camera. By utilizing advanced photogrammetry software such as PhotoModeller Scanner or 3DReality, a dense and accurate surface model can be created. 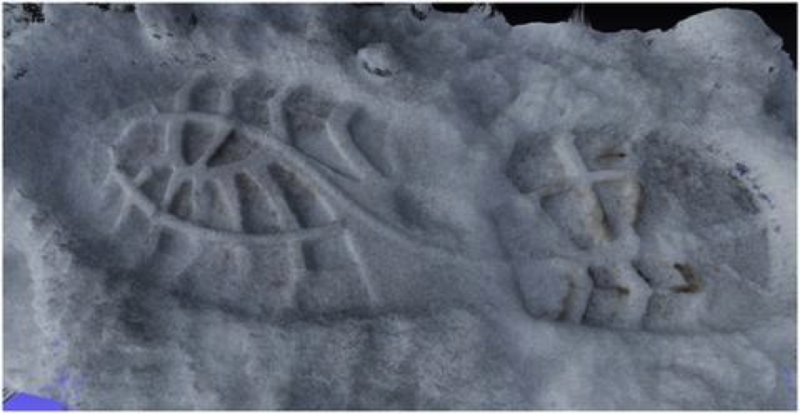 It is important to note that the 3D model is a replica of the footprint and not a surface that is cast as a “negative”. The created digital model can be easily converted into a readily acceptable format for 3D printing and in the absence of more adequate casting materials, time, or resources, laser scanning or photogrammetry can prove to be beneficial. Another area in forensic science where 3D printing may prove to be useful is fingerprint examination. Small scanning systems allow for a suspect’s fingerprints to be captured fully in 3D. Traditionally fingerprints at crime scenes are captured through the use of powder and tape, they are eventually scanned or photographed as a high-resolution image. “The source of the prints are all curved and contain highly detailed ridges and pores.” The resulting 3D model is able to capture all the ridge detail and can be used for investigative comparison purposes. 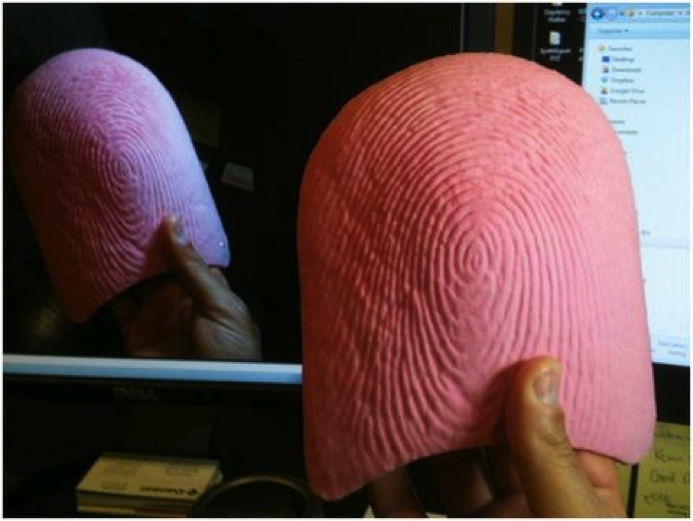 In court jurors can benefit from large-scale 3D replica of a suspect’s fingerprint by being able to easily visualize the 3D replica and they also have the benefit of haptic perception. Fingerprints are a good example of how we can take something small and create it at a much larger scale to bring out specific details, which would normally not be easily visible by the naked eye. Fingerprint examiners in training benefit from the having the ability to visualize and feel what an enlarged 3D replica of a person’s finger looks like before making a flat print comparison. Vehicle accidents represent an area where much is disputed and litigated on a regular basis. In many instances it takes more than just photographs to do a proper investigation. It is possible to scan vehicles just as they are found at an accident scene to give a more accurate account of how vehicles may have been found in their final rest positions, as more police agencies adopt laser scanners. 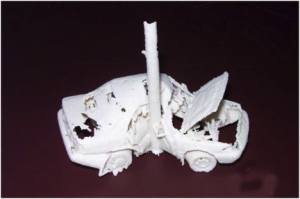 In the courtroom, a witness can physically hold a model of a crushed car and point out areas that were of importance. Physical 3D replicas can preserve some evidence for future viewing by juror and lead to more accurate decisions. Using physical 3D replicas crush and extent of damage can also be shown to jurors. There is often attention and investigation into the cause and origin of large scale and structural industrial accidents. Haag 3D has used laser scanners to document crane disasters where a large structural member has failed. Printing a scale model of the first floor in a home where a crime was committed. Recreating a physical copy of a weapon found at a crime scene. Displaying bullet trajectories through 3D scanned article of clothing. Printing a scaled model of a collapsed building due to a bombing.